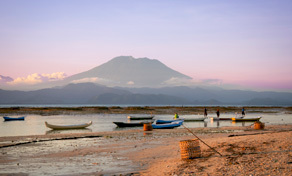 Nusa Ceningan is a hidden gem of Bali, less known, same beauty. Unspoiled yet not unreachable; this lovely small island is just 40-minute fast boat ferry and 5-minute longtail boat away from Bali’s shores, which makes it a flawless spot to visit. Also, the stunning Ceningan is linked with the neighbor island Nusa Lembongan by a small hanging bridge, perfect spot to take amazing photos. Ceningan is the smallest island from the Nusa’s trio, perfect to be covered by foot exploring all its charms. It is full of exotic and natural places to discover and have a lot of action; adventurous souls fall in love with this place and its adrenaline, the amazing views, the rich sea life and the myriad of hills to jump. Once travelers get in there, they rapidly forget the fact that they are less than an hour away from the hustle and bustle of Bali. A place that will take your breath away without any effort, located on the eastern side of Nusa Ceningan, this incredibly blue lagoon is the main attraction on the island. The first thing that will amaze you is how bright and intense the color of the water is, travelers frequently say that there isn’t another place that has the same blue color as the Blue Lagoon in Nusa Ceningan. However, this incredible place is not only for admiring nature, it also has the most popular cliff jumping on the island; as the water is very deep, locals argue it is impossible you get to the bottom, no matter if you jump from the highest point (around 13m); once you get in the water, a short swimming to the bay and it is done. Be aware that, during the low tide, local authorities may consider this activity unsafe and they may prohibit it. Nusa Ceningan is the smallest one from the three island group, maybe that’s due to the fact that it is the less frequented and discovered. Nevertheless, this wonderful place has incredible beauty and rich nature. 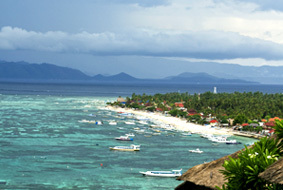 The tourists and travelers that give Ceningan a chance, rapidly discover the wonders the island has. 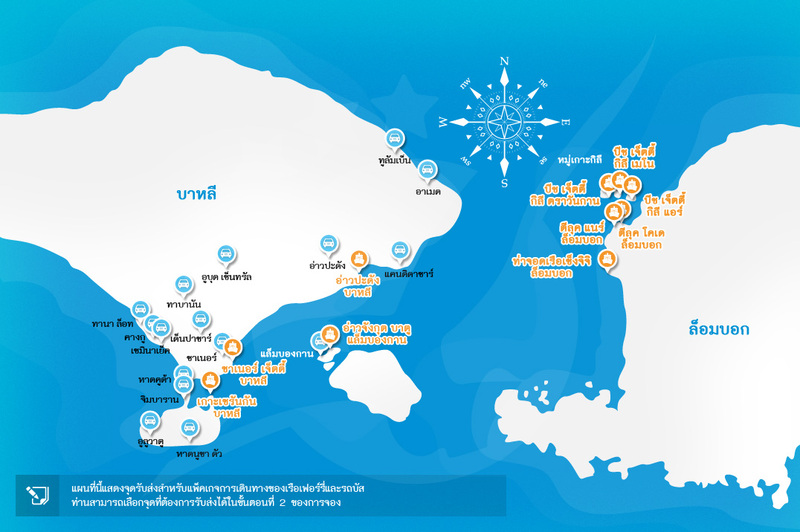 Moreover, adventurous souls seeking for exotic places to practice aquatic sports in isolation or at least without having to share the space with many other people, easily find in this island the spot they were looking for. 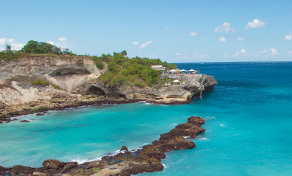 Diving, snorkeling, exploring the mangroves and surfing are flawless options in here. Actually, there is a small portion of the island called Secret Point; it is famous among surfers who love this isolated place with amazing waves to practice. 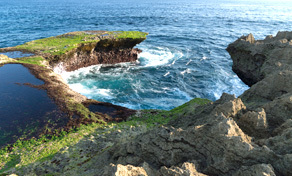 Nusa Ceningan has among their attractions, hundreds of cliffs facing the sea. Locals have discovered in those cliffs, amazing spots to jump into the sea from heights between 3m, 6m, 9m and even 13m from the shore. Start with the smallest one if you’re feeling unsure or dare yourself in the highest for full adrenaline sensation. Locals will nicely lead you to the best spots in the island; luckily, everything in Nusa Ceningan is a short walk away distance. 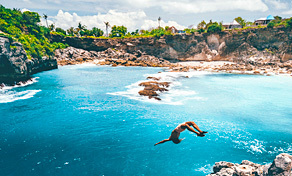 This activity has become so popular lately that even some bars that are located at the top of a cliff offer their customers the opportunity to jump into deep waters from the terrace. Even though this small but incredible island has a lot of places to jump, the best one by far is the famous Blue Lagoon. Locals keep practicing many of the activities they did before tourism discovered this amazing island, getting to know their culture is easy and much appreciated. One amazing thing every traveler in Nusa Ceningan must give a try is watching locals working in their seaweed farms. Bali is one of the biggest areas where seaweed is cared and cultivated nowadays, and Ceningan has a big part of this farming. There are different forms to get in touch with this ancient work, go directly to the seaweed farms and join locals for a couple of hours while they harvest in the coast or simply walk to the many cliffs located in the southwest coast of the island; from there, you will get amazing views of the farms and farmers doing their job.